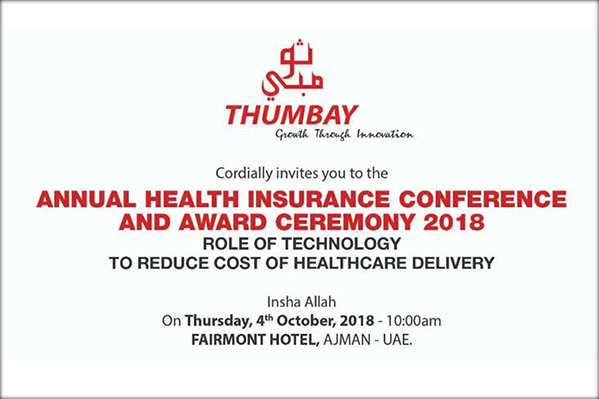 Leading experts in the field of health insurance will receive special awards of recognition at the ‘Annual Health Insurance Conference & Award Ceremony 2018’ to be held at the Fairmont Hotel, Ajman on Thursday, 4th October 2018. Dr. Thumbay Moideen, Founder President of Thumbay Group will be the chief guest. The conference is being organized jointly by Thumbay Hospital – the largest network of private academic hospitals in the region and Gulf Medical University – the biggest private medical university in the region. The scientific sessions of the conference will be led by expert speakers who will outline the role of technology to reduce cost of healthcare delivery. The insurance sector in the UAE has experienced a great deal of growth and innovation, as the country is one of the fastest growing health insurance markets in the GCC. The introduction of mandatory health insurance in Dubai has brought a new phase of development to the country’s insurance sector. The Government’s relentless efforts to improve the health of the people and to ensure affordable access to healthcare services signify further growth of the health insurance sector and its growing importance in the economy. The ‘Annual Health Insurance Conference & Award Ceremony 2018’ is a great opportunity to meet top experts and professionals in the field of insurance and healthcare, and to stay up-to-date with the latest and emerging trends in the field. The conference will discuss in detail, various issues such as the opportunities and scope of health insurance, trends and future directions of the sector, as well as ways to ensure success and sustainability, through panel discussions, presentations, interactive sessions and case studies.